Chauffeured Limo offers Meet & Greet Airport Service. A company could make a good impression on their business contacts when they arrange for a chauffeur driven limousine to pick up their important clients at the airport instead of sending one of their senior officers or secretaries. In addition, with a pre-arranged limo service, the chauffeur will go inside the airport and hold a sign with the individuals name and company on it to alert the person that they are to go with the driver. This is the 'meet and greet' service offered by our limousine company and it is very impressive to those who have experienced it. When a company has important guests arriving from out of town at the airport, they will want to make a good impression on them. Having a chauffeur driven Lincoln Town Car pick them up would be one way to impress them. A Lincoln Town Car is elegant and not over stated with a lot of party items like some of the stretch limos. These are better suited for business people and will get them in and out of where they need to go, especially the airport without any trouble because they are average car size and not longer. Our chauffeurs are trained to be professionals and will know how to act in all situations during meeting and greeting customers at the airport. If a business wants to send along one of their representatives to meet and greet a client or boss at the airport, the limo will pick them up first and then travel to the airport. The driver will hold up a sign with the guests name on it and the company representative could stand next to the chauffeur to greet the individual as they come out of the terminal with their bag. The limo driver will take the bags and walk in front of the guest and representative and load the bags in the trunk and then open the doors for the passengers. Once the meet and greeting has been completed, depending on what time of day or evening this occurs, the chauffeur could take the passengers for a lunch or dinner before taking them to the office or the guest's hotel. 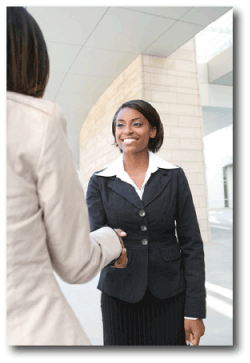 For business people, it is important to make a good impression and having one of their representatives meet and greet the incoming guest will do just that. Having a chauffeur driving limo accompany the representative to the meet and greet will increase the impressiveness and make the entire experience all that much better for the incoming new client, boss or special guest. Everyone likes to be treated like they are special and when a business hires a limo service and sends out one of their upper management officials to meet a guest at the airport, they will feel special, no matter the reason for their visit.